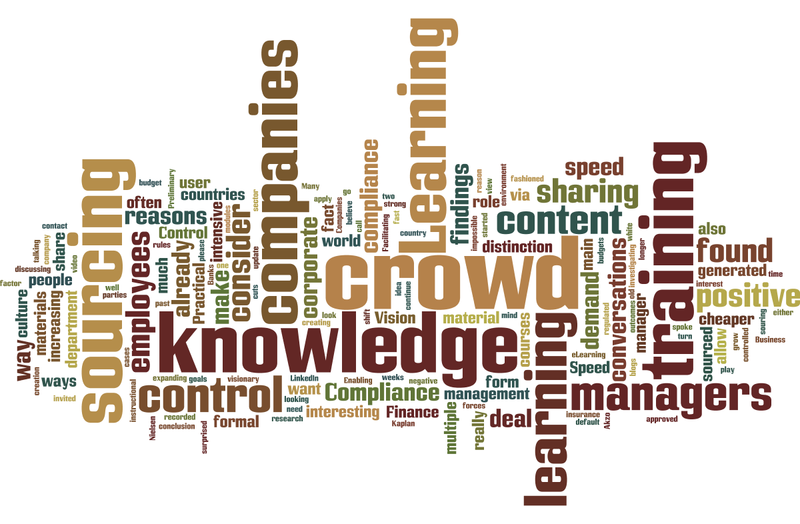 I’m investigating crowd sourcing of corporate knowledge. You can also call it the use of user generated content if you want. Over the past few weeks I have spoken to dozens of training managers all over the world. I found some reasons for companies to consider this option or to reject it. This post contains my findings. I’m investigating crowd sourcing of corporate knowledge. You can also call it the use of user generated content if you want. Over the past few weeks I have spoken to dozens of training managers all over the world. I found some reasons for companies to consider this option or to reject it. Here are my findings. I started this process by talking to three companies (Nielsen, Akzo Nobel and Kaplan) who have already implemented crowd sourcing. We have recorded the outcomes of these conversations in a white paper, which you can download here. I found four reasons to do or consider crowd soucring (Vision, Finance, Practical and Speed) and two reasons not to consider this (Control and Compliance). I will explain each reason in more detail. The visionary Learning manager really believes that crowd sourcing or user generated content is the way to go. In their view it is no longer the role of the Learning and Development department to control and steer the learning and knowledge management of the employees but to facilitate it. Enabling employees to share their knowledge through video blogs, posts, social media (yammer) or in the form of courses and quizzes is an important part of that. Many Learning managers have to deal with budget cuts or with a fast expanding organization and budgets that do not grow with the same speed. They have to find ways of reaching their goals in a cheaper way. Facilitating employees to share their knowledge is much cheaper than creating complete courses by instructional designers or third parties. Very often they make a distinction between approved training materials (like compliance training) that need to be perfect and materials where perfection is not required. The latter can be crowd sourced. The demand for training material is increasing. Especially companies that are knowledge intensive and that are spread out over multiple countries have to deal with this. Due to the fact that companies become more and more knowledge intensive they demand for training and knowledge sharing is growing. Companies that have locations in multiple countries also have to deal with the fact that a default course for the whole world does not work; it has to be translated and localized for each country. These Learning managers turn to crowd sourced content simply because they are not able to cope with the demand in the ‘old fashioned way’. Business processes are changing at an ever increasing speed. It is (almost) impossible to deliver learning and training material at the same speed. This forces them to look at other ways to create the content, crowd sourcing is a solution for this. It is much faster than the creation of eLearning modules by the L&D department. Most Learning managers that are considering crowd sourcing (or that are already doing it) will have a combination of these motivations. Most of the time one of them is the dominant factor but the other ones play a role as well. The main reason not to consider crowd sourcing is control. Some Learning managers indicated that they and their company do not want to lose control over the learning content. Their corporate culture does not allow them to make that shift. The management will not allow it and the employees are not in the sharing mode. A bigger form of control is found in companies that are in a heavy regulated environment. Compliance is the main driver for learning and that matches control. I found that in the financial sector (Banks, insurance companies) this argument is used a lot. It is really interesting because some of these companies make a clear distinction between the formal compliance training (has to be controlled) and other less formal knowledge and training. While other companies apply the rules of compliance training to all learning activities. Like control I do believe that this has to do with the corporate culture. A majority of the managers I spoke was positive about crowd sourcing knowledge sharing and learning. This is not a scientific guaranteed research (by far). I invited them via LinkedIn and asked them if they has an interest in discussing this topic with me. It is very likely that people who are positive about this crowd sourcing idea will respond more often, than people who are opposed. But I was surprised by the amount of positive responses, it is clearly a trend that is on the mind of Learning Managers. I will continue my conversations and I will update you if I have more interesting outcomes. Are you a Learning manager with a strong feeling (either positive or negative) about crowd sourcing knowledge sharing and learning, please contact me via mail@kasperspiro.com. I’m already looking forward to these conversations.